At this time the stock markets have been consolidating in a sideways pattern for nearly six months. The pattern appears to have completed or is near completion coincident with the development of significant watershed moments in the US and European debt situations. It also corresponds with the heart of earnings season (and the resolution of the NFL players lockout, the latter being of the highest order of importance to this trader :] ). The pattern, whether viewed from an Elliott Wave or more traditional technical analysis perspective, is more likely to resolve bullishly than bearishly. Tape action--market responsiveness to news, earnings and technical events--has been largely bullish as well. 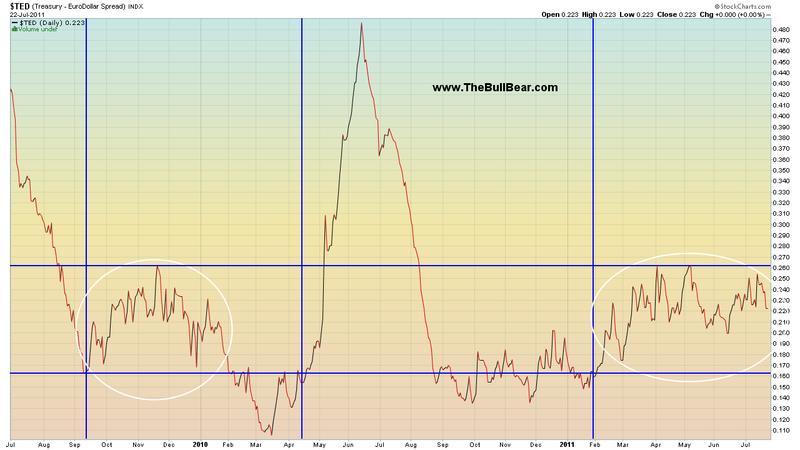 Psychology appears to be sufficiently negative to support a bottom as well. While doom and gloom are not at apocalyptic levels, there is a pervasive sense that after six months of grind and whipsaw, traders are tired and at a loss and are sitting on the sidelines waiting for the right cue. All in all, this is the stuff of which major bottoms are made. BullBear Traders are looking to build long positions as the market passes through a bottoming process soon, probably coinciding with the announcements of the downgrade of US sovereign debt and a DC debt deal. 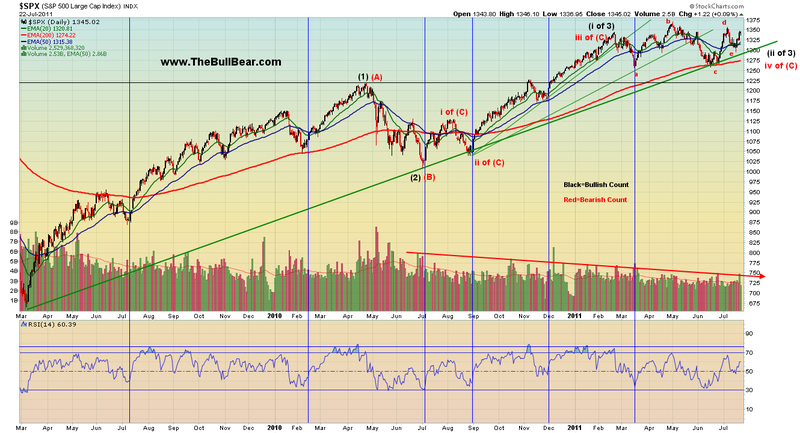 We are also keeping our eyes open to the possibility of a significant bearish market break. Recently there was broad expectation that a failure of the US Congress to reach an agreement on raising the national debt ceiling and a default by Greece would initiate a Lehman-esque debacle in world equity markets. Essentially, both occurred within a 24 hour period and the markets shrugged it off. The news is out and so far no signs of "collapse". This makes sense, since for quite a long time it's been obvious to any informed observer that the US and Greece are both bankrupt and that some form of default and downgrade would be forthcoming. Markets have had more than ample time to price in both events. And it seems that markets are distinguishing between corporate equity, which trades on the stock exchanges, and government debt. There is no sense at this time that the earnings and solvency of corporations need to be questioned in tandem with the fiscal condition of governments. Corporate balance sheets have never been healthier and P/E ratios are low. Bears are warning that since the solvency of banks and the credit worthiness of assets worldwide is heavily dependent on the condition of the sovereign debt market, that simultaneous downgrades and defaults in the US and Europe would usher in another deep credit crunch and once again send world asset prices spiraling downward. It's interesting that the obscure workings of the interbank credit market became nearly mainstream news during the 2007-2009 credit crisis, but at this time garners no attention whatsoever. The rates at which financial entities measure risk were keenly watched during the financial crisis. At this time we are seeing absolutely no indication of any fear or abnormal risk in interbank lending. The London Interbank Offered Rate (LIBOR) is a daily reference rate based on the interest rates at which banks borrow unsecured funds from other banks in the London wholesale money market (or interbank lending market). This can be seen from the point of view of the banks making the 'offers', as the interest rate at which the banks will lend to each other: that is 'offer' money in the form of a loan for various time periods (maturities) and in different currencies. At this time LIBOR is at a very low level which suggests that there is a very low perception of risk in interbank lending. On Friday there was a small spike upwards as the likelihood of a downgrade of US debt increased and rating agencies put Spain's debt on watch for downgrade. We'll need to keep an eye on this, but so far the rate is far from crisis levels. http://3.bp.blogspot.com/-6_UJ_O0t_5s/TiyQ...%2524LIBOR3.png The TED spread is the difference between the interest rates on interbank loans and short-term U.S. government debt ("T-bills"). TED is an acronym formed from T-Bill and ED, the ticker symbol for the Eurodollar futures contract. The current reading of .159% (and falling) is well within normal parameters and not showing the least sign of increasing interbank credit risk. 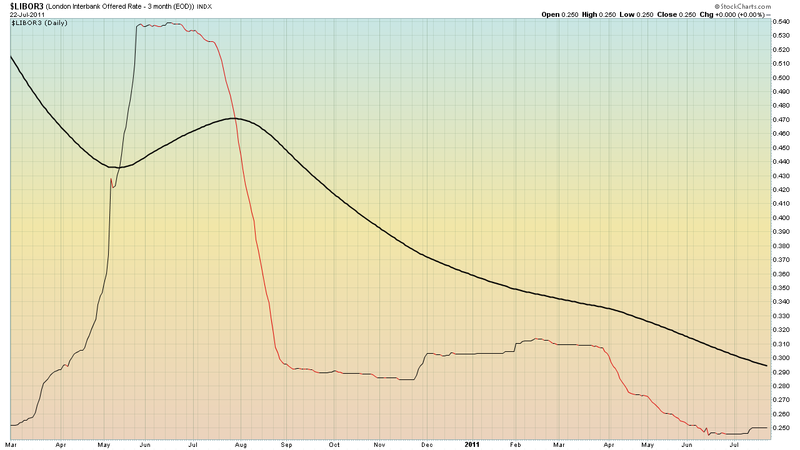 The Libor-OIS (LOIS) is the difference between LIBOR and the overnight indexed swap rate. The spread between the two rates is considered to be a measure of health of the banking system. At this time LOIS is showing no real signs of crisis or elevated risk. If a financial meltdown resulting from sovereign credit risk were possible, probable, likely or imminent it seems that we should have seen this reflected in the interbank credit markets, and we have not. As further confirmation of this, the US Treasuries market has seen only modest pressure on the middle and long end of the term spectrum throughout this "crisis". Apparently investors, governments and financial entities worldwide concur that major systemic risks are not present at this time. 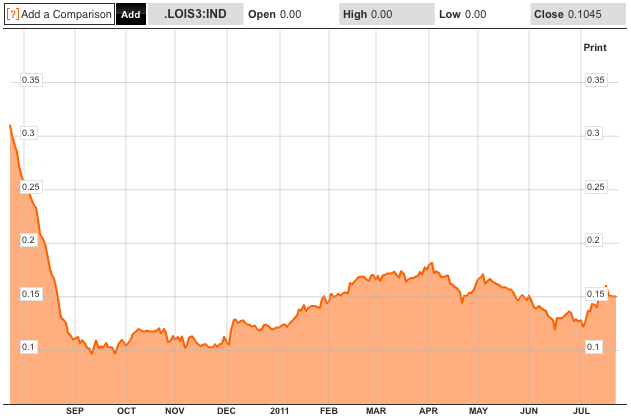 On Friday, as equities markets tumbled, Treasuries spiked higher to levels not seen since December 2010. I would not be surprised to see Treasuries spike even higher on a downgrade of US debt, but I might be looking to short that spike. Naturally, traders need to be cognizant of risks to their capital and this is no time to fall asleep at the switch. But neither is it time to be excessively risk averse. The evidence seems to indicate that an important panic low buying opportunity may be imminent. At this time I am going to conclude that a nearly six month long abcde triangle formation is in the process of being completed and that our benchmark SPX index is in the end stages of a significant correction. Below I have alternate Elliott Wave counts on the chart. In black I'm counting the beginning of a iii of (3) major bull wave and in red I'm counting the start of a v of © to complete a long term bear market D wave. After extensive consideration, I would have to say that I would have to favor the conclusion that the entire move off of the March 2009 low is a massive D wave within the context of a long, sideways ABCDE triangle formation. If so, a likely scenario is that the final wave of D completes in the vicinity of the B wave high as the temporary fix of the US and European sovereign debt crises unravels thereafter, prompting a partial E wave retracement to finally complete the bear market. At that point sentiment will have shifted to a bullish extreme and available sideline money will have been committed to the markets. There are of course several long term bullish counts in which the move off the March 2009 low is the first wave of a new long term bull market and several long term bearish counts which favor the commencement of a bear market from current levels. To read the full BullBear Market Report and receive daily updates to this analysis, please join us in the BullBear Traders room at TheBullBear.com.